We had a prenatal/seventh chakra class in my teacher training. First we did a prenatal style class with pillows stuffed down our shirts. That was fun! A pillow really doesn’t inhibit movement in the way a pregnant belly does though, even when the pillow is HUGE. I did feel a little odd in the class. I had just come from an ultrasound (for my knee) and was feeling a little hyper aware about the fact that if I want any more children I should probably get on it soon. I can’t even imagine how intense this feeling must be for woman who haven’t already had children. Getting older is really noticeable when it come to fertility issues. After we did a short class on how to teach pregnant woman and then moved onto the studying the seventh chakra. The chakra class was (for me) incredibly unsatisfying. 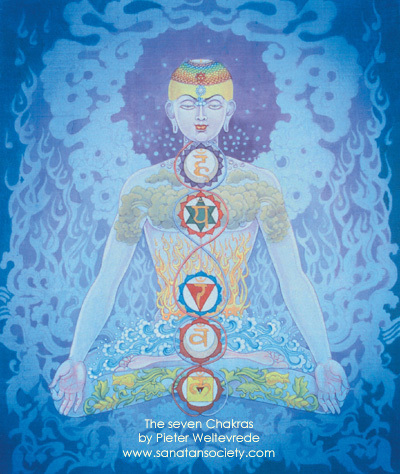 There seems to be this general opinion that the seventh chakra is the “culmination of human evolution” . This is where we are trying to “get to”. I believe this “getting somewhere” type of thinking really gets in the way of us realizing we already are divine and complete. And when I say we, I don’t really mean we. I mean ALL, EVERYTHING… I feel it is a little shallow to think this enlightenment/consciousness/spiritualism has much to do with our lives at all. It is like we are taking REALLY BIG concepts and are trying to stuff them into little small containers that our brains can handle. My teacher didn’t really approach the subject matter as “trying to get somewhere” but it still ended up having that feeling somehow. I think there are just times where words become clumsy in explaining things. Perhaps I would have learnt more about the seventh chakra if we had just sat there in quiet meditation together for an hour. It just got me frustrated. Letting go of our ego, being good.. none of this really matters when it comes to BIG SPIRITUAL CONCEPTS. Being good might have benefits in our lives. It might make us feel good but ethics is a human problem. Seventh chakra has nothing to do with this sort of thing in my opinion. And what about those starving kids in Africa. Do we really believe in Karma? Do we really believe they deserve to suffer like that because of some past life mistakes? I am ranting now. I will stop. There is a movie both my partner and I quite enjoy that gets into the subject matter of oneness, or allness, or everythingness in a way I quite enjoy. It is called “Who’s Driving the Dreambus?“. I think this speaks a lot to yoga and the concepts that seem to be embedded in the yogic scriptures. I have included the trailer below.